Dana Andrews was one of Hollywood’s biggest stars during the mid-1940s to early 1950s. A basically decent man, Andrews struggled with alcoholism for decades. His addiction affected his film career; other stars got roles that should have gone to him. Carl Rollyson’s biography is comprehensive and fascinating. Rollyson obviously respects his subject, however, he is objective when it comes to some of the unattractive and disturbing incidents in Andrews’s life. Andrews was born in Collins, Mississippi in 1904. His father, a Baptist minister, moved the family to Huntsville, Texas to accept a pastorate there. Somewhat rebellious, Andrews’s pursuit of an acting career was shunned by his strict parents. A talented singer, Andrews also studied opera. As soon as he was able, he moved to California to pursue his dream of acting success. He eventually became a regular performer at the famed Pasadena Playhouse where he met second wife, Mary Todd. Hollywood eventually came calling and Andrews was signed by legendary independent filmmaker Samuel Goldwyn in 1938. After some small and supporting roles in films like the Ox-Box Incident, Andrews hit pay dirt as Lieutenant Mark McPherson in Laura, playing opposite Gene Tierney. 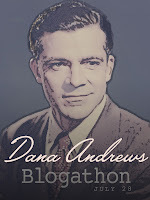 A critical and financial success, Dana Andrews was now a full-fledged movie star. Success, and all the trappings that came with it, was tough for Andrews to handle. His drinking started to get in the way of his career and personal life. Amazingly, for the years he was a major star, his drinking rarely affected his on-screen work. Andrews worked with major directors like John Ford, Otto Preminger, Fritz Lang, William Wyler, and Lewis Milestone. If it weren’t for his drinking, Andrews may have starred in the classic films Gentlemen’s Agreement and Twelve O’Clock High, both going to Gregory Peck. He finally conquered his demons late in life and was able to enjoy acting on the stage with his wife. A family man at heart, Andrews loved his wife and family passionately, if not perfectly. Apart from learning a lot about Andrews the man and actor, the reader comes away with an understanding of what the life of a movie star was like under the studio system. As you might imagine, it wasn’t as glamorous as we were led to believe. Rollyson’s work is respectful and objective, painting a rich portrait of one of Hollywood’s most beloved movie stars. Hollywood Enigma: Dana Andrews is available at Amazon.com and bookstores everywhere. Rollyson is a professor of journalism at Baruch College, CUNY. He is the author of more than thirty books, including the forthcoming American Isis: The Life and Death of Sylvia Plath and biographies of Marilyn Monroe, Lillian Hellman, Martha Gelhorn, Norman Mailer, Rebecca West, and Susan Sontag. He is the advisory editor of the Hollywood Legends Series. Take a look at the Dana Andrews blogathon posts to learn more about the actor and his most famous movie roles by clicking here. Thanks for sharing your thoughts about this book. I have been interested in reading it ever since I made Mr. Rollyson's acquaintance back in January. 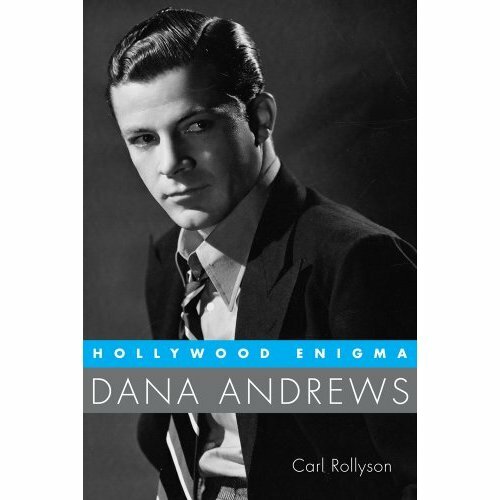 Always a solid actor, Dana Andrews deserves to be remembered through this biography. Thanks for stopping by, Patti. It's an interesting look at an actor we really know so little about. Andrews shunned public life. He liked being a movie star because it enabled him to get some great roles, but he hated all the movie star trappings like the fan magazines, movie premiers, and all the Hollywood politics. Sounds like an interesting book, and certainly long-anticipated. It was interesting and certainly an insight into Andrews's life and character. It's amazing what to think what roles he might have had had he not let the alcoholism get the better of him for so many years. My favourite Dana Andrews movie is "The best Years of Our Lives", and I absolutely love the scene you've included - when he sits in the cockpit of that grounded bomber, reliving his war experiences. Thanks for stopping by. Dana Andrews's performance in "The Best Years of Our Lives" is truly amazing. I still can't believe he wasn't nominated for Best Actor for his performance. TBYOOL is also one of my favorite movies of all time. The biography is interesting and details how he came about getting the role of Fred Derry. Andrews overcame a lot to achieve success, but he could never seem to reconciled himself to Hollywood and all the trappings that went with it. Still he lived an extraordinary life. I'm really looking forward to reading this bio now, after having read your review! I don't think you'll be disappointed. I'm reading a biography of Marilyn Monroe by the same author right now.